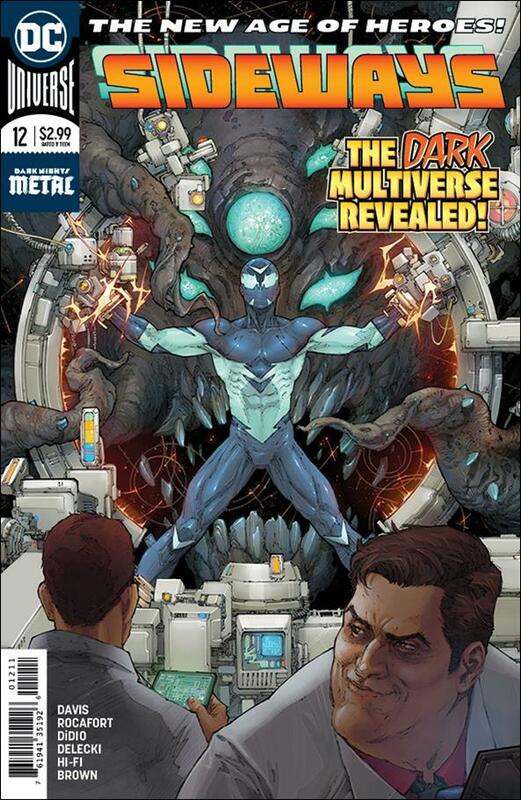 Last time we saw our new hero, Sideways, he was trapped inside a machine created by Dark Star Sciences meant to open rifts into the Dark Multiverse. With Derek trapped by the people who killed his adoptive mother, how can the young hero make it out? More importantly, what caused the massive explosion that rocked the building? Who survived and who died? As Gotham news covers the explosion, Detective Hopkins, the man handling Derek’s mother’s murder case, makes his way to the building. As he clears people out, he makes his way to the floor that was destroyed by the explosion. On that same floor, Derek is coming back into consciousness when he hears Hopkins call out for survivors. Unfortunately for Sideways, Hopkins immediately recognizes his voice. Sideways dawns his mask and attempts to throw Hopkins off, but it doesn’t sway the detective. Sideways reaches Hopkins and rifts them to the police precinct, assuming Hopkins will want to turn him in. To Derek’s surprise, Hopkins is more interested in what exactly happened inside Dark Star Sciences. We then see what happened to cause such a massive explosion. While Sideways is trapped inside the rift machine, he demands to know why the head of the company, Ms. Dominus, killed his mother. She denies killing her and states that she doesn’t care who did. As she checks the status of the machine, Derek tries to persuade her to stop the experiment. Despite his best effort, the experiment proceeds and a rift begins to open up. As we see the opening from the Dark Multiverse side, there is a figure standing there that says if this plan succeeds, the world would be at risk. As Derek continues to plead for the devices to be shut off, monstrous creatures begin to come through the rift. As they get into the lab, they begin tearing the place apart. Luckily, one of them breaks the machine holding Sideways, allowing him to break free. He begins to formulate a plan, then an idea hits him. “Then I had a crazy thought. I’ve always wondered what happened if I opened a rift inside of a rift.” As Sideways leaps into the rift, he opens a smaller one that has unintended side effects. It turns out that creating a rift inside of a rift creates a black hole. As the lab is sucked in, so is Derek. He says that as he was being pulled in, he accepted that this would be his end, but he was saved. Temple Fuginaut, the cosmic entity from the beginning of the series, makes the save and deposits Derek back into the lab. As Hopkins processes everything he was told, Derek asks if anyone else made it out of the lab. When Hopkins tells him that he was the only one, Derek replies, “Then I didn’t save anybody…” Hopkins disagrees, saying that Derek may have saved the world and recommends that he goes home to get some rest. The next morning, Derek is woken up by his adoptive father. The last conversation these two had ended with Derek’s father saying that he didn’t want to raise him anymore, so this could get bad. However, despite their last encounter, he tells Derek that they will work through their loss together. He then tells Derek that he will try to raise him, but he’s going to need help. The doorbell then rings and Derek’s father gets the door. When he opens it, he reveals a woman named Rocio Ramos, Derek’s birth mother. It seems the fight with Dark Star Sciences is over. The lab was destroyed, and their people are either dead or trapped in the Dark Multiverse. The only loose end is Ms. Dominus. Now that she has claimed that she didn’t kill Derek’s mother, we’re left wondering what Derek’s next move will be. That next move is further complicated by the arrival of his birth mother. Perhaps now that she’s here, he can find out a little more about why she gave Derek up. Unfortunately, due to the series being cancelled, there is only one issue left in the series to be released. How can DC tie everything up with Sideways in one issue? Is he going to retire his suit and try to be a normal teenager? I’m not convince this is the true end of Sideways, however. The solicitation for issue 13 says that this is the end of his journey for now. Perhaps a run with the Teen Titans is up next for Sideways. As a Gotham City resident, perhaps he can run into Batman and work with the Dark Knight. Regardless of how the series ends, I have hope that we’ll see plenty more of Sideways in the future.